How do I export a file to my local machine? How can I save a file to my workstation? You may access your local or network file locations when working in an application hosted by Blackbaud Hosting Services. For example, you can save a file from your application to your desktop, or another folder located on your computer. 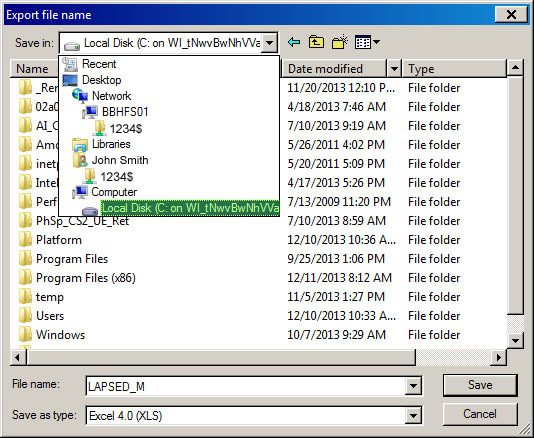 This article describes how to access and use local or network drives from a hosted application when you are exporting or saving a file. As a note, permanent files such as Crystal Reports and files for scheduled queues must be saved in the hosted Files Folder. Note: Network drive access must be enabled before your organization will be able to use network or mapped drives from a hosted application. Click File > Export in the process or report to print. Change the save location by clicking on the ellipsis button next to the file name field. This will open the navigation window. Browse to the location on your computer where you want to save your file. Due to common file restrictions on the root directory of a windows computer (C:\), we suggest not saving to C:\ and saving your file within a folder. Mac Users: If you receive the prompt to allow access to the drive, select Read & Write. Note: Saving to your local drives (and network or mapped drives, if enabled) is available in any application hosted by Blackbaud Hosting Services. You may also set a local or network drive as the default export and import file path. Note the file path. Does it match the path that you navigating out to when saving your system exports?